Four IBS Awards, including Best College Station in the Nation. In addition to winning the Abraham and Borst prize for Best College Station in the Nation, KCR nabbed Best Online Station (National), Best Blog and Best Play-by-Play Baseball (Patrick Carr, Ryan Posner, Sean Nichols). 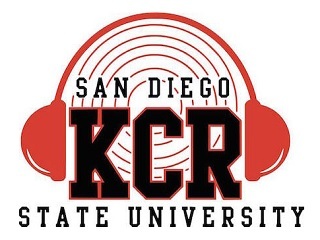 All this following recent donations from an SDSU philosophy professor and an alumnus, which allowed the station to recently expand its campus reach to the AM airwaves. There were all sorts of cool sessions at this year’s IBS March 4-6 event, including “History of Punk and Rock Music,” for which author Legs McNeil was joined in person by Gillian McCain from London via Skype, and “How I Made It: Radio Success Stories,” which welcomed voice-over artist Harry Legg, Ebro in the Morning executive producer Jason Griffith, United Stations Radio Networks’ Margaret Verghese and Westwood One’s Suzy Schultz.